Are you someone who goes gaga when you’re exhorted to join an angling trip but become disheartened the moment you recall that you didn’t much luck catching game fishes on your last few expeditions? There are some fish species like trout, salmon, tuna, and bass that is available abundantly in almost all the seas, oceans, and large freshwater lakes. For instance, the largemouth bass is one species that abounds in the water-bodies of North America. Without exaggerating a bit or mincing words, it can be stated confidently that you don’t need to be a seasoned angler to net a black bass, white bass, striped bass, spotted bass, smallmouth bass, Guadalupe bass, and Choctaw bass. It is the abundance of largemouth bass which makes it easier to hook one compared to other species. Just go through the following bass fishing tips, techniques, and tricks, and surely test these tactics when you join the anglers’ group next time. Bass is a predatory fish species that prefers to feed on frogs, small snakes, crawfish, scuds, insects, and shrimps. They’ve the capacity to gobble up the baits that are half as long as themselves. Also, they like to pounce on their prey or baits that are somewhat injured or wounded. Keep in mind that the black bass is one species of fish that intensely avoids bright sunlight and always looks for sanctuaries that are sheltered under canopies of trees or overhanging boughs. When the sun is out with a full vengeance, you can look for a school of bass camouflaging inside a seaweed network or swim in shallow water beneath a bower of trees. Alternatively, you can drop your fishing line in the high waters when the weather is cloudy. Now that you’re aware one of the most important bass fishing tips, you’ll have it easier if you’re told that basses are game for ‘red herrings’. That is just a literary expression meaning diverting attention from the real issue and misleading an individual. Basses are readily misled into believing that the bait or prey is injured if the same has a reddish hue. So, when you move to shallow areas inside a glade or wood, make sure to dangle the bait with a red hook. 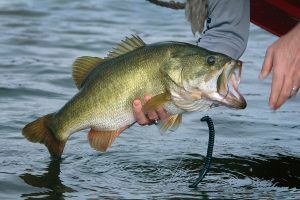 If basses happen to be swarming in the area, surely some will bite the bait hook, bass lures, and sinker. Basses have large mouths (no wonder they’re called largemouth) with jaws along with sharp teeth. Perfectly sharpened hooks or claws mean these will pierce through their jaws and sit there firmly thereby enabling you to reel in your catch conveniently. 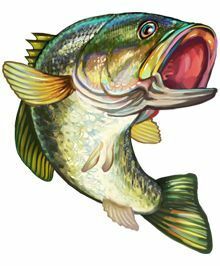 Professional anglers are cognizant of the fact that basses are attracted by the bedlam or din created by buzzing sounds. A little research on the net will throw up many sites stocking and retailing buzz baits. Or, you can search on Amazon for the bestselling buzz bait brands. These are available in a variety of color patterns and sizes. You can opt for ones that you feel will be suitable for your situations. Basses have a tendency to swim along with the natural flow of the water. In other words, they’re more comfortable with swimming downstream rather than upstream. For you, it means you’ve better chances of baiting basses if you’ve positioned yourself in the direction of the water current. Throw the line or cast too far away so that they catch the bait before they spot your launch or boat. Spawning activity of the basses is at an all-time high during the spring season. It is during the vernal months when the water temperature is ideal for spawning. The weather also stays calm at this time of the year with very few squalls and thunderstorms-perfect conditions for males and females to mate. The fishes retreat to the shallows, nearer to the shores for laying the eggs. So, you don’t need to venture very deep into the waters to catch the largemouth. Just take a stand near the shoreline and you’ll be netting such a large catch that you may have to make separate arrangements for bringing the same to shore. Basses will take the bait not only from hunger but also out of exasperation. However, make it a point to rerelease female basses back into the water so that the spawning is complete and the lifecycle is maintained. The sea or ocean waters are prone to becoming boisterous and rough. More often than not, the waters are rough and in full spate owing to the surge of the current. Then there are sharp gravels, rocks, flotillas, tree stumps and branches to contend with. There’s every possibility of your line getting distorted or frayed due to these obstacles. Hence, it is imperative that you keep a constant watch over your fishing line in order to keep it floating in a straight line. This is another significant bass fishing tip that you can make the most out of. If your fishing trips are confined to some specific spots, then you can observe what some trapped basses have in their stomachs. Carrying out this check will give you a fair idea on what the basses are stocking up on. So, the next time you embark on an expedition, make sure you hook similar baits so that basses come flocking. The eating patterns and habits of this species of fish keep changing with the season. During the spring season, basses feed on crawfish while in fall and summer, they gorge on the shads. Accordingly, you can use baits that are colored like crawfish or the shads. So, there you’ve it, the simple guide or basic bass fishing tips. Of course, the listing is not an exhaustive one and you can fish for more tips to enhance your possibilities of catching bass during your angling trip. Fizhing.com is a participant in the Amazon Services LLC Associates Program, an affiliate advertising program designed to provide a means for sites to earn advertising fees by advertising and linking to Amazon.com. Copyright text 2016 by Tule.